Twenty-two black-faced spoonbills in Taiwan have been banded for observational monitoring. Of the sixteen with recorded detailed marks, at least ten were consistently observed over a two-year period at the estuary of the Tsen-Wen River. Another three spoonbills that had been banded in Hong Kong were recorded. It can then be presumed that this species have a high fidelity for their wintering areas even though some individuals are possibilities to change. Close observation of these birds have revealed that the breeding blumage appear during the third or fourth year of life. Early in life, these younger birds stay in the wintering areas longer than the older ones. These birds, as they age during the adolescent “subadult” stage begin returning to the northern breeding sites earlier than they did in years past. Their morphological development have also been well documented: as they mature, the smooth, long, and flesh-colored mandible becomes black; the mandible bars grow; yellow eyespots appear; Eyeiris become red; and black flight feathers faded to pure white. For this species, more than half population (51.4%) have yellow decorating feathers called breeding blumage on the rear-head and necks during the breeding season. It’s been estimated that only about half of these actually breed. From other related studies, the population growth rate in Taiwan appears to be about approximately 10-16%, with a recent decline in the past four years (1997-2001). This decline is probably due in part to the loss during migration. It is also possible that other wintering sites have not yet been discovered. The black-faced spoonbill (Platalea minor) is one of the rarest birds on the planet and is on the verge of extinction. There are only a mere 900 of these birds left in the world (January 2002). Platalea minor is the rarest of the six Platalea species within the family Threskiomithidae. These birds live predominantly in Eastern Asia. Their breeding area covers northeastern China and some islands between the border of North and South Korea. Their wintering area is spread over Taiwan, Hong Kong and Vietnam, with more than one half of the population wintering at the estuary of the Tsen-Wen River in Taiwan. Mei-Lee Wei1 reports a study where 18 black-faced spoonbills from Taiwan and Hong Kong were banded with radio transmitters. Signals were monitored by satellite during the 1998-1999 period. Through this monitoring, they have discovered many of the routes and the reproduction sites for the black-faced spoonbill. Among the banded black-faced spoonbills, seven flew back to islands near Korea; two were found in the Yen-Chen sanctuary of Jiang-Su, China; one probably stayed in Taiwan. Migration routes were seen from Fujian, Zhejiang, and Jiangsu along the coast of China all the way to North and South Korea. Although this study has taught us much about the life of the black-faced spoonbill, there are still many questions left to be answered. 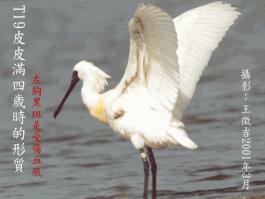 Beginning in October of each year, black-faced spoonbills begin flying to the estuary of the Tsen-Wen River in Taiwan. Their numbers peak there between the end of November and the beginning of December. It was observed that couples often brought a juvenile along, forming what is presumably a family unit. Interestingly, the groups of adults returned to the north with golden decorating feathers during March of the following year, leaving behind the sub-adults and juveniles. These sub-adults and juveniles stay until May or early June, at which time they would fly north to join the adults. This observation suggests that Taiwan is an important place in the life cycle of this species. Only by further research can we better understand what special role Taiwan plays in the life-cycle of Platalea. There are still many other issues to solve, including the fate of the marked black-faced spoonbill, the places they go, the physiological and morphological change during their physical development, their life expectancy, etc. The continuous investigation and recording for the ringed individuals are crucial and demand a tremendous amount of effort and time. In the banding study, there were 22 black-faced spoonbills recorded by Shen-Chin Chen2 and Mei-Lee Wei1. Among them, seven carried radio transmitters with signals monitored by satellite and eleven were equipped with radio transmitters with local signals. There are 16 with detailed marking records. These combined data have allowed us to identify the migration routes, reproduction area, and the general distribution for wintering at the estuary of the Tsen-Wen River. (1)	Marked black-faced spoonbills at wintering sites of the estuary of the Tsen-Wen River Between December of 1999 and May of 2001, at least one record was collected weekly for marked black-faced spoonbills wintering at the roosting sites of the estuary of the Tsen-Wen River. The record includes the number ring of right foot and color ring of left foot, mandible bars, eyespots, eyeiris, flight feathers, and decorating feathers. The results are described below. (A)	There were totally 22 banded black-faced spoonbills which 16 has detailed marking record during December of 1999 and May of 2000. Among them, T07 (nicknamed “Super”) and T09 were not seen again, leaving fourteen that were recorded at the estuary of the Tsen-Wen River during this period. Interestingly, these fourteen were joined during this period by three black-faced spoonbills that had been banded in Hong Kong. During the next year, between October of 2000 and May of 2001, four additional birds were missing [H2, T01 (nickname “Lucky”), T06 (nickname “Joe-Dee”), and T08], leaving ten that were recorded during this period. This time, the ten were joined by another four spoonbills that had been banded in Hong Kong. (B)	T10 had developed a swollen right foot, which made identification difficult. Although the colors on his left foot were clear, unequivocal identification of T10 required the description of its vibrating feathers. T10 came in the beginning of October 1999 but was not observed to leave until the May of 2001. It is possible that it did not return to its reproduction site. (C)	The adults T14 (nickname “Pioneer”) and T16 (nickname “Turtle”), always returned to the north between the end of February and the beginning of March. Interestingly, sub-adults returned to the north on the second year significantly earlier than on the first year. This observation suggests that two to three-year-old sub-adults, mature to acquire breeding capabilities within the following two years. 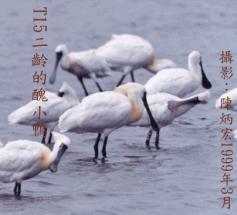 (D)	Of the 16 banded black-faced spoonbills in Taiwan, 14 returned the first year and 10 returned the second year. The high rate of return suggests that black-faced spoonbills develop a preference for their activity area. Interestingly, the three black-faced spoonbills that were banded in Hong Kong appear to have made repeated visits to Taiwan. This observation suggests that individual birds have some flexibility in the choice of wintering sites. The mandible spoon of the juvenile is flesh-colored. When these birds are about one year of age, there are changes that appear with feather-change mechanisms. The stratum corneum is gradually strengthened; the bars are extended from the upper nostril to the lower mandible end. As they are growing older, the bars are started showing mixed spots. The black-faced spoonbill is considered old when its spotted mixed bars on the upper nostril accumulated the amounts close to the skin edge. For grown-ups, dots are appeared on their eyes and faces but the color and shapes differ individually. 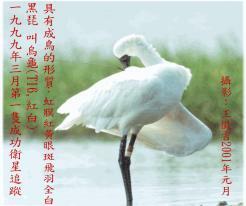 In addition to referring to the aforementioned3 and “Birds – feelings for black-faced spoonbill in Chi-Ku country,”4 the author observed and recorded the ringed spoonbill’s weekly appearance at the estuary of the Tsen-Wen River during their wintering period from December of 1999 to May of 2001. This record documents yellow breeding blumage, mandible bars, yellow eyespots, eyeiris, and flight feathers. Furthermore, the conclusions drawn below were based upon the information at the time of banding and the records documenting the morphological changes during these two years. (A)	The feathers in summer of black-faced spoonbill adults are mostly white. Between the beginning of February to the end of March, however, these birds bear yellow decorating feathers, also called “breeding blumage,” extending from the back of the head to the breasts. In 2000, only four (H1, T6, T14, and T16) had yellow feathers. In 2001, this number increased to nine. Other than T10 who had a leg injury, all banded black-faced spoonbills observed bore yellow breeding blumage. Extrapolating from the estimated that age that they were ringed, it appears that these black-faced spoonbills bear yellow breeding blumage during the third or forth year of life. 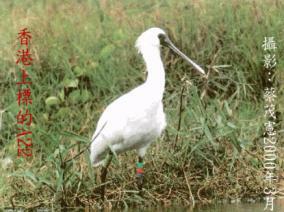 [Note: In 2001, yellow breeding blumage was observed in Taiwan on two spoonbills ringed in Hong Kong (A08 and A09)]. On the five islands of North Korea during the breeding seasons of 1999, Dr. Jon-Lei Jeng recorded 217 black-faced spoonbills and 29 breeding nests, each of which were occupied by one male and one female. Among the 217, 58 (26.7%) were adults with reproduction capabilities. At the International Seminar for Black-Faced Spoonbill Protection held in Japan during June of 1997, the North Korean report showed an 80% successful hatching rate of this species in 1996; the growth rate of the juvenile was reported at 49.9%. In 2001, for black-faced spoonbills at the wintering sites of the estuary to the Tsen-Wen River, the peak of yellow breeding blumage occurred on March 6 with 180 out of 350 (51.4%) birds bearing yellow breeding blumage. Comparing this figure with that of the Korean report, it appears that only one half of the black-faced spoonbill with breeding blumage actually breed. Thus, for the 720 spoonbills observed in January of 2001, approximately 720×26.7% =192 bred forming 96 nest. Estimating about three eggs in each nest, there should be approximately 288 eggs leading to about 288×0.8×0.5=115 successful hatches. That is to say, if the conservation work is well done, there should be about 115 new black-faced spoonbill each year, which calculates to a population growth rate of about 16%. The estuary to the Tsen-Wen River is an important site for more than one half of all wintering black-faced spoonbills globally. 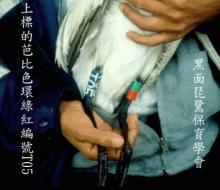 In Taiwan, the Chinese Birds Association used to take charge of the census monitoring of these birds. Since 1997, the Tainan County Black-Faced Spoonbill Conservation Association (BFSA) started to take daily records on the numbers. For the last four years, the numbers from BFSA and Chinese Birds Association have differed. The average growth rates from BFSA are close to 10% whereas those from Chinese Birds Association have been 30%, significantly increased in 2000 and –13.6% remarkably decreased. The data from BFSA maintained growth of 4.7% and 12.6%. The data from areas other than Taiwan may show differences. There is, however, no information from these areas to be available. Additionally, other areas are inconsistent wintering areas for the black-faced spoonbills that come there. Furthermore, it is possible that there exist many other wintering sites that we have not found yet. There were growth rates of 23.3% and 15.6% in 1999-2000 and 2000-2001, respectively. Black-faced spoonbill is extremely rare and precious; conservation efforts are necessary to preserve this species. During 1997-1999, an international effort between in Taiwan, Japan, Korea, and Hong Kong was initiated to monitor these birds by with ring. For these birds, it was estimated that more than half wintered at the estuary to the Tsen-Wen River of Taiwan. This information prompted further research, observation, and records in Taiwan to follow-up the investigation of ringed black-faced spoonbill. Recent observations made by BFSA in the last two years have helped us characterize the wintering behavior, breeding statistics, and morphological development of these birds. Specifically, the morphological changes were observed with regard to their mandible bars, eyespots, eyeiris, and flight feathers. In addition, the yellow breeding blumage has been observed to appear at approximately three to four years of age. In autumn each year, the parents take the offspring in a family unit to Taiwan. 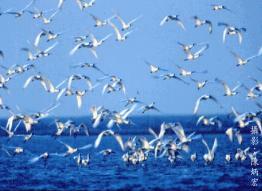 This migration leads to peak numbers in the wintering sites between the end of November and the beginning of December. The following March, the adults with yellow breeding blumage return to the north, leaving behind the juvenile and the sub-adults who join them later in May or June. These observations suggest that Taiwan is an important wintering site for genetic exchange. As observed in breeding area in Korea, this species follows single-partner system. We have learned much from the observation studies that have been performed on the Black-faced spoonbill in recent years. We will need continued international cooperation in future research to answer the future important questions. It will be important to characterize their lifetime mating practices, the age they start breeding, and how long these birds live. Undoubtedly Taiwan might the key place for the study. 1 Mei-Lee Wei, Proposal for satellite monitoring black-faced spoonbill, Green-Birds monthly, February, Shin-Ju Wild Birds Association, 2000. 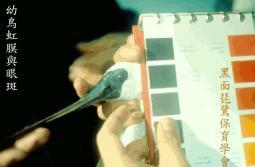 2 Shan-Chin Chen, Ringing Study of Black-Faced Spoonbill, Peasant monthly, no. 9, vol. 5, Chinese Wild Bird Association, 2000. 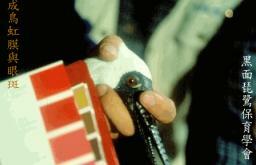 3 Chon-Chen Kuo, About the Morphological Characteristics of the Black-Faced Spoonbill, http://cc.asjh.tn.edu.tw, 2001. 4 Jin-Ju Tsai, Birds – Chi-Ku and Spoonbills at Country (I), Tainan County Black-Faced Spoonbill Conservation Association, 1999.